Photochemical reactions are of high relevance, for example in solar energy storage through photosynthesis in plants. Even humans perform photosynthesis by generating vitamin D in their skin (see Fig.1). An important reaction step in this synthesis from pro-vitamin D to pre-vitamin D proceeds via an electrocyclic ring-opening, which is predicted by the Woodward-Hoffmann rules. Photochemical ring-opening leading from pro-vitamin D3 to pre-vitamin D3. The six-membered ring which opens during the reaction is highlighted. It is the same structural feature like the molecule 1,3-cyclohexadiene, which we investigated in our current study. How do such reactions work in detail? Visible and ultraviolet light frequencies exclusively interact with the electrons of a molecule, since these are much lighter than the nuclei. However, the most obvious change induced by a ring-opening reaction is a rearrangement of the nuclei in the molecule, i.e. the opening of the ring. Thus, the electrons and nuclei somehow need to talk to each other to enable the reaction. However, the well-known Born-Oppenheimer approximation tells us that electrons and nuclei usually do not talk to each other. The mechanistic feature enabling efficient cross-talk and energy exchange between electrons and nuclei in a molecule is a conical intersection. Near a conical intersection, electronic states come so close that their energy difference is on the same energy scales as the nuclear levels. This in turn leads to strong cross-talk. The strength of the electron-nuclear coupling at conical intersections leads to very short reaction dynamics on the femtosecond timescale. They can be investigated spectroscopically using femtosecond lasers. Most spectroscopic methods, however, are more sensitive to changes in the electronic structure of a molecule and less to changes in the nuclear structure. Due to the strong coupling of electrons and nuclei at the conical intersection, a thorough understanding of how photochemical reactions proceed can only be achieved by also looking at the nuclear structure. View of our experimental setup including the vacuum chamber, in which the ring-opening reaction took place. We have investigated these nuclear structure changes during the photochemical ring-opening reaction of 1,3-cyclohexadiene, which can be regarded as a model for the aforementioned photosynthetic vitamin D generation step. To be sensitive to the nuclei, we used ultrafast electron diffraction (see movie), a method pioneered about 20 years ago by the Nobel laureate Ahmed Zewail. Only recently, however, could femtosecond temporal resolution be achieved with this method, which is critical for following the photochemical ring-opening. In the experiment, we excited the molecules with a femtosecond laser flash of ultraviolet light. 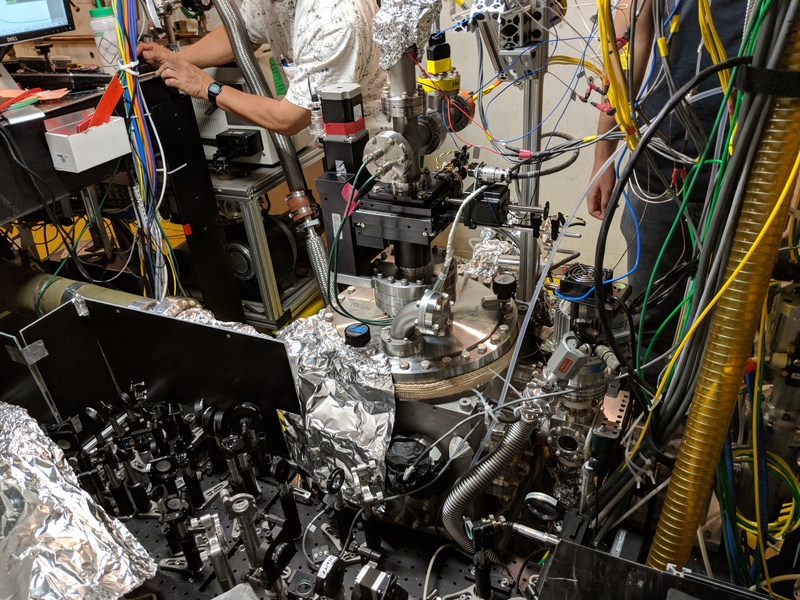 After a delay, which we could control precisely, we took a stroboscopic snapshot of the nuclear structure using a femtosecond electron pulse. The electrons of the pulse bounce off the nuclei in the molecules. Thereby, electrons bouncing off different atoms in the same molecule can interfere with each other. The interference is sensitive to the distance of the two atoms in the molecule. Thus, by measuring the interference, we obtained direct information about atomic distances in the molecules at the time the stroboscopic snapshot was taken. By repeating this measurement at different delays between the ultraviolet laser pulse and the electron pulse, we could stitch together a movie of the photochemical ring-opening reaction. This movie shows us two things we previously did not know about the ring-opening reaction. The molecule already starts the ring-opening before it reaches the conical intersection. However, the opening motion speeds up considerably after reaching the conical intersection. Furthermore, the reaction product 1,3,5-hexatriene is a comparably flexible hydrocarbon chain. The ring-opening motion transforms into a twisting motion of this chain, which can be followed up to at least a picosecond after the start of the reaction. Our experiment demonstrates that ultrafast electron diffraction is a useful tool for investigation of photochemistry in organic molecules.